Lately I’ve been playing a computer game called Tales of Maj’Eyal. I wanted to talk a little bit about how resource management in that game works and what lessons we can take away for board games. Let’s dive in. Stamina. Click the ability, stamina is reduced by the cost, if you don’t have enough then you can’t use the ability. It comes back over time. Mana. Click the ability, mana is reduced by the cost, if you don’t have enough then you can’t use the ability. Depending on who you are it might not come back naturally and you need to use another ability to restore it. Souls. Click the ability, souls are reduced by the cost, if you don’t have enough then you can’t use the ability. Comes back each time you kill someone while close enough to hoover up their soul. Equilibrium. Click the ability, equilibrium is increased by the cost. Then there’s a %chance roll to see if the ability happens or if you’ve wasted your turn – the higher your equilibrium the higher the chance of a missed turn. It falls over time. Paradox. Click the ability, paradox is increased by the cost. Then there’s a %chance roll to see if you get a paradox backlash instead of your ability – the higher your paradox the higher the chance of a backlash and the more extreme the backlash. Your current paradox level also acts as a multiplier for the power of your spells, so high paradox makes you more powerful. It returns to a level of your choice over time. Insanity. Click the ability, insanity is reduced by the cost, if you don’t have enough then you can’t use the ability. The higher it is the greater the random number added or subtracted from everything you do. It falls over time and can only be restored in combat by using abilities that generate it on hitting enemies. There are a bunch more: Hate, Vim, Positive Energy, Negative Energy and Psi – but you get the idea. The consequence of this variety of resources is that similar abilities can feel very different because of the resources they use. You can have two abilities that fundamentally do the same thing – say shoot a beam damaging everything along the beam – but the resource it uses depends on how you apply it. If it uses mana then it makes sense to use it early and often, but you want to keep a plan in mind to escape combat and recover if you run short. If it relies on insanity then your opening gambit needs to include some insanity gain to make it useful, so you’re trying to find a way to combo with another ability that both generates insanity and pulls opponents into a line to get the most out of the follow up. If it’s using paradox then you can use it an awful lot, but there’s an associated risk – do you start at a high pardox so your opening salvo hits hard or a low one so you get more shots before you risk exploding yourself? The fact that the ability/resource combination is meaningful allows a game to have a lot of skills. In the same amount of time you could design ten abilities, you could design five abilities and five resources – generating a total of twenty five possible abilities. Not all of those would be any good, some would surely be eliminated through playtesting, but it’s a way to put a lot of variety into a game without having a huge amount of rules to learn.
. Race for the Galaxy has cards that’ll allow you to play a some planets by discarding cards or by having enough military. Descent will let you move a space using a point of movement or a point of fatigue. You can hold a territory in Game of Thrones using a unit or using a power token. Doing the same thing using different resources that function in different ways is a great source of meaningful decisions – but in these games it’s not the core of the game, it’s a neat extra thing. There are also games that let you simultaneously manage several resources in order to buy things using their combination. Something like Splendor offering the player several types of gem to make their purchases. But in these games the resources all behave in fundamentally the same way. 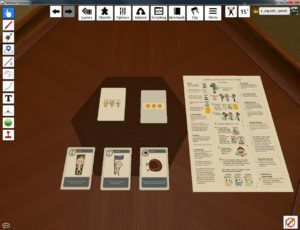 I can’t think of an example of a tabletop game that’s really embraced the possibilities of concurrent asymmetric resources either as a way to create distinctions between players or to produce meaningful decisions in how players progress – but I’d be really interested to see one attempted. If I don’t find one perhaps I’ll give it a whirl some day. How about you, have you heard of one? Is there a game I should try to see how this works in practice? Today’s topic is third order balancing, but I’m going to talk about it in the context of a game I’m working on called Genesis. Partly because that makes it easier to understand and partly because writing about the subject might help me find new solutions for that game. Let’s get started! Genesis is a game in which the players take the role of gods struggling over the world. Each player selects three domains to decide what sort of god they are – these are things that could finish the phrase “God of…” like war, death, love etc. Each domain grants the player a champion, each one of which has three cards, giving everyone a hand of nine to begin the game. On their turn each player simultaneously chooses and plays a card. If they play a card for a champion they’ve already got in play the old one is discarded, otherwise it’s added to their existing champions. All champions (including ones still present from previous turns) use their special ability. Finally the champion with the highest power is added to a winners pile. Whoever has the most champions in the winners pile after someone runs out of cards (Usually nine turns) wins the game. So far, so good – so what’s the balancing problem? Well obviously it’s desirable to make sure that the domains have a roughly equal chance to win. If one offers champions that are simply better than the others then you may as well pack away the game after domains are chosen and announce the player with that domain the winner. There are some fairly obvious answers here. Making sure that all champions in a domain have the same total power and then adjusting it up or down a smidge based on how useful their abilities are seems like the answer. The abilities follow a standard form of having two icons, one for who is targeted and one for what happens to them. A handful of standard abilities like “target all enemies” and “discard from play” occur across all domains, but each domain also has a unique icon that only appears to cards from that domain. That’s what makes being a “God of disaster” feel like being a “God of *disaster*” rather than “The god wot gets a 3 5 and 8 rather than a 1 6 and 9”. Special abilities make things tricky because the context of the game then starts to matter. For instance the champion of beasts has a power 4 monster card that grants itself the pack leader icon which gives +1 power for each monster in play. So what power should I consider that card? Played in isolation its a 4 – but in theory there might be four players with three monsters out each so he could be a 16. I could work out the average number of beasts in play if everyone’s playing randomly – but people won’t play randomly. You might anticipate that the player choosing the beast domain will choose two other domains that have a lot of monsters in so that they can power up thier own ability. Their opponent might decide to be a god of water. This gives them access to the powerful flood card and its “Destroy all monsters in play” ability. So is the champion of beasts any good? Are they a decent 7 because their owner will synergise with three monsters, or are they weak because they signal a creature type giving the opponent information to exploit? But wait, it gets worse! Suppose I have chosen to be the god of beasts and my opponent has decided to counter by being a god of water. I still want to play monsters to get my bonus, but have to account for the possibility that my opponent will play “kill all monsters”. Can I do anything about that? You bet I can! I could decide to be a god of weather and have beasts with the “Unaffected by abilities that cause instant kills” or I could be a god if disaster and have “Destroy and protect effects are reversed, all destroy powers protect and all protect powers destroy”. My opponent has similar options, they could see that I’ve planned for their plan, but they can plan for my plan that I’ve planned for thier plan! Perhaps they’ll take “God of fear” with its “Target does not get to use its ability” powers. Which gives us a tough time of balancing – because in order to determine how powerful we think the beasts domain is we’re now taking into account the existence of the fear domain. But, when it’s time to edit the fear domain, we need to take into account the existence of the beasts domain. Now the ultimate answer is, of course, the same as it always is: Lots of playtesting! No matter what tricks we try to pull there’s no substitute for watching the game played lots of times and seeing which domains tend to win and lose and making changes based on that. But with the interconnectedness of all cards being what it is, there’s a huge advantage to starting playtesting from a position that’s closer to our goal state than one at random. So let’s consider what we can do. The obvious first step is to aim for the champions of each domain to have the same total power – since printed power ranges 1-9 then an average of 5 might seem appropriate. However we intend to reduce power totals later in line with how good the cards abilities are, so actually starting at an average of 6 or 7 seems like a smarter idea. The next step is harder, which is to determine the average value of abilities and adjust the power of cards downwards accordingly. Here the goal is to make a determination of how much an ability is worth and remove the appropriate amount of power form some card in its domain. Now a player can enhance an ability by playing cards it synergises with and their opponent can do the opposite. The active player has an advantage here since they know when they’re going to play the second half of the combo, but their opponent might get their timing wrong. However the active player might not want to pair it with the best possible option to make it harder for their opponent to predict and counter. Here I make the following assumption “The value of an ability is worth approximately what it’ll be worth when combo’d with the second best option in a situation that’s halfway between a random situation and the optimal position to play that ability in.” and go forward on that basis. The core of the game is selecting champions and using them at the right moment to maximise their effectiveness. Perfect timing should be rewarded and implementing this philosophy means every ability has the same value at the third order: It’s always 0 because your opponent has always won. This simplifies the calculation substantially. This calls for the game to contain cards which are very strong given the right predictions. “Kill all X” are highly effective, so long as every card has a class and every class has at least one kill all associated. Also cards of a form “Make a prediction about the card your opponent has chosen but not yet revealed, if you’re right then kill it.” Then things that counter or reverse particular abilities like “Your opponents card targets itself rather than its intended target” or “Kill powers now protect and protect powers now kill”. This is a process I’ve now been through with this game over nine times. Each time I rewrite a great many cards trying to obtain a new balance that makes me happy – one that makes the domains equally likely to win, but also preserves their uniquess and makes the game more about skill than luck. 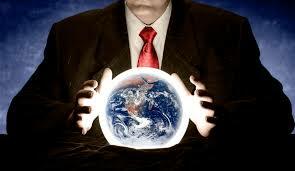 A player needs enough information to make a prediction or the game falls apart – a perfect information zero randomness game can be a game of chance if players don’t make meaningful decisions after all. The iterations of playtesting are having an impact on how easily I can value abilities. At first “This is worth a +1 that is worth a +2” was pretty much guesswork – but as time goes on I’m more likely to change an ability in a way that is right first time. Or to anticipate how making a change in one place means that something that’s worked just fine for the last three iterations now also needs to change, without needing to see an unenjoyable game to see it happen. 1.It’s good to have some sort of abstract (I hesitate to say necessarily mathematical) model to get your early game as close to a goal as possible before testing. 2. Don’t abandon the model when you start testing. Instead refine it and keep using it, it’ll make each iteration more productive. 3. You can nuke the third order balancing problem by making a certain order of prediction powerful against everything (Though this is only a start). This game isn’t perfect yet and my approach isn’t perfect either, but that’s where I’m at today. I’ll let you know if it’s any different tomorrow. Hiring an illustrator for your games cards can be expensive. I’ve had quotes anywhere between £10 per card and £300 per card. 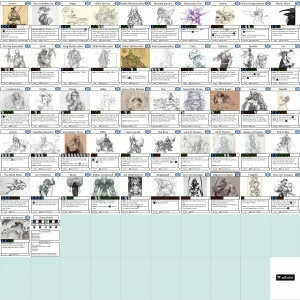 The complexity of the art style you’re looking for, the experience and reputation of the artist and a host of other factors play into this figure. Given that a card game could easily have 54 cards requiring an image each that could be the difference between £540 and £16,200 over the course of a game. It’s a big decision. Escape the Nightmare raised less than £10,000. If we’d hired a top rate artist then the art costs alone would’ve been greater than the project raised. The art really needed to be on a budget for the project to be successful. Scandinavia and the World raised over £61,000 – we could’ve spent a significant amount on art and still had the project work out overall. The trouble is this: For each game we had to determine who the artist was (and therefore our art spend per card) before the game was launched. A good project means showing a good game, which means showing some final art. Knowing what to spend on art is dependant upon knowing how well the game does because the cost is divided between all games rather than on a “per game” basis like manufacturing is. So you need to know how well the game will do before launch to make an optimum art decision. Now in both of these examples we dodged the question on the publisher side. With Escape the Nightmare we used art from artists who’d usually charge closer to the top end of the scale, but we’d already paid for the commissions for another project and (with their permission) didn’t need to use it again. With Scandinavia and the World we were partnered with a webcomic who got a share of the profits but provided all of the art. That’s not always possible though, it hasn’t been for more than half of our previous projects and probably won’t be for our next one – so lets talk about what a designer can do. Knowing that we weren’t paying a cost per card on EtN and SatW my design brief was “Use as much art as you want” and the design of those games reflects it. The situation for other games is different. The artist has to be chosen before how well the project is done is known, but the designer has control of the other side of the equation: How many pieces of art does this game need? The first is simply to design the game in a way that requires the fewest possible pieces of art. If a game can say “Well there are five types of card and the piece of art on a card will depend on its type” then you can spend almost whatever you want on the art per card without meaningfully impacting the overall budget. This is often the simplest solution, but can make it harder for the game to deliver its theme and is something worth trying at a prototype stage (rather than prototyping with art everywhere knowing damn well it won’t be there in the final thing) to see how testers find it. The second and more complicated approach is to try to make the amount of art in a game flexible, so that the decision about the amount to spend on art can be made after the amount available in the art budget is known. This is trickier from a design perspective, but the goal is to have cards that could have individual images or that could all have the same image. For example a game might have cards for “Fire bolt” “Fireball” and “Inferno” that could share an image or could have different images. If the project goes well then they get one image shared between all of the cards. If it goes exceptionally well then the extra budget can be used illustrating them individually. I think this is fairly common, most likely as a result of designers coming up with games they’ll pitch to several publishers who have different approaches to art. I don’t want to name a game here because while I’d mean it as “Here’s something sensibly designed to make sure gamers get the most out of their work” some idiot will take it as “I accuse this designer of being cheap” – but I’m sure you can generate lots of examples from your own games collection. Off the top of my head I can think of a dozen examples of game where cards with titles that imply they could be drawn individually, but that share art in a way that works and feels consistent with the theme. 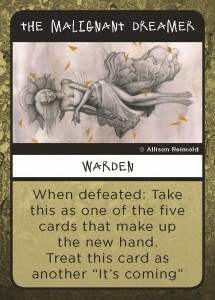 The opportunity for designers to modify games to suit art doesn’t end at theming cards to permit art duplication if necessary. It’s good for design to magnify every aspect of a game wherever possible. For instance with the Genesis project 3DTotal is very keen on bringing in a very high quality artist. That means spending a lot of money on art and a design that does the best to really show off and integrate that art is going to be important. There are a few games out there now using tarot sized cards rather than the traditional 63x88mm cards. That’s all well and good – but a game has to be designed for that from the ground up! The physicality of a card changes how they are used. A game with physically larger cards needs to minimise activities like shuffling that are harder with more cumbersome cards. It’s also important to consider the amount of space a game needs on the table to make it playable in the environments you’d like to see it played. On the other hand it also presents opportunities – you can make more assumptions about what a player can see on their opponents cards from across the table for instance. The point that I’m driving at with this post is that there are a lot of things that can be thought of as “The publishers problem” that are made easier or harder by the choices a designer makes in building their game. In a good game the design of the game itself and its physical nature and presentation are intertwined. It’s worth being conscious of the pressures facing your publisher and of their strengths and limitations so that you can make the most out of working with them.